It has long been established that minority students face disadvantages in testing, and testing agencies have addressed this issue with careful analysis and revamping of questions. But what about inside the classroom? 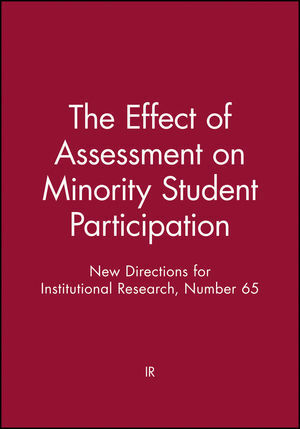 The Effect of Assessment on Minority Student Participation reports the results of the research and analyzes the data to gain insight and suggest a new direction. Rigorous analysis backs thoughtful discussion in an effort to begin the conversation and make the necessary steps toward an equal playing field. IR - Institutional Research - is the author of The Effect of Assessment on Minority Student Participation: New Directions for Institutional Research, Number 65, published by Wiley.